Three terrorist attacks shook the city of Brussels Tuesday, and people around the globe quickly responded with shock, horror, and sympathy. Front pages from around the world following the Brussels attacks portrayed the chaotic aftermath and the increasing fear of more terrorist plots from ISIS. At the same time, though, images of the Belgian flag, praying hands, and crying cartoons were juxtaposed with photos of victims covered in debris and blood, signifying how the international community bands together in such an event. At least four men carried out two assaults in the Brussels international airport and one at a major subway station in the Belgian capital Tuesday morning, killing at least 31 people and injuring hundreds. ISIS quickly took responsibility for the brutal attacks, and definitive links have been discovered between this week's tragedy and the Nov. 13 Paris attacks. 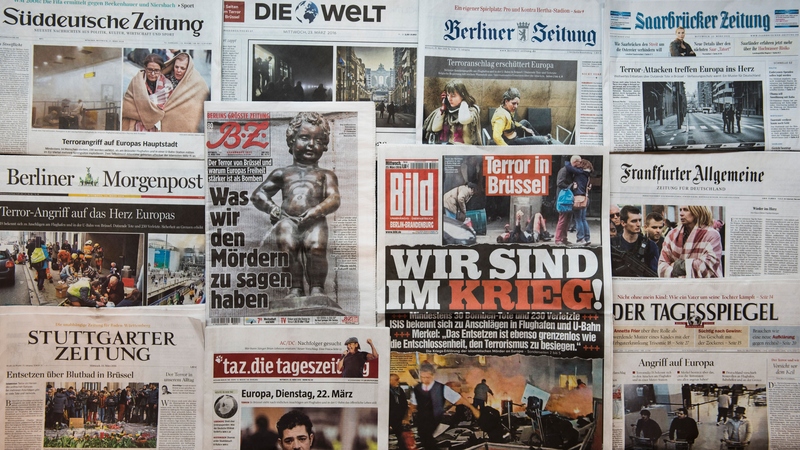 Not much was known about the suspects involved or the motives behind the explosions when newspapers finalized their front pages, but they're a good indication of how people in different parts of the world reacted to the news and started their Wednesday. Here are front pages from around the globe the day after the Brussels attacks, offering a visual depiction of how far the affects of the violent terrorist plots extended. Warning: Some of the following images are graphic. Brussels wasn't alone in the tragedy, as the world joined the nation's shock and grief.